Organizational Readiness on the mind? Competition gets everyone onboard. Ever tried to move an entire company at the same time? Then you know how important it is to engage your people early (and often) to ensure everyone is ready for your organizational change. We’ve found that infusing change and learning with friendly competition, fun challenges, and freaking awesome measurement gets the right information, at the right time, to the right people, to get them to want to do what they have to do. TiER1 has combined behavioral science with social game mechanics to create a fun, measurable, and integrated approach that gamifies adoption and change readiness. We call it Adoptify. Our clients call it a game changer. When it comes to organizational readiness, Adoptify can help overcome change resistance and get your people ready. Adoptify is a custom web experience combined with weekly challenges to engage employees in micro experiences over a sustained length of time. With each challenge, teams cooperate to compete against each other and track their progress against others through leaderboards. This generates high engagement and participation while also proving robust, constant insight into readiness metrics. We’d love to help you game the change in your organization. Let’s connect! If you want to learn more about Adoptify, request a brief walk-through below or give us a call at (859) 415-1000. From there, we came up with the idea of gamifying the desired changes and behaviors that are critical when a change goes live. This strategy—which we called Adoptify—empowered our client’s people to want to engage in the change at their organization. Even though participation was optional, using weekly communication, leveraging leadership, and measuring readiness based on the completion of challenge tasks, our client saw unprecedented participation and change readiness across the company. A large health insurance company needed to roll out three new enterprise systems across six teams and nine roles. That meant getting over 500 participants completely trained and up to speed on the changes by go-live. When they heard about our previous work with the Adoptify strategy, they wanted in. We helped our client define a communication campaign that told the story of the systems change in a way that was relevant for end users. We also developed a series of engaging, measurable challenges for participants to complete in teams for some friendly competition. The result? Our client’s organization achieved 100% readiness for the change by the go-live date. A publicly traded specialized services company faced large-scale change: a systems implementation involving 250 locations across the United States with over 30,000 end users. Organizational readiness was a critical success factor for this change—and we knew that Adoptify would get them there. TiER1 developed measurement capabilities so that the client could see how each location was performing and each individual was owning their change. We also empowered local teams to drive the change, rather than putting the pressure on a centralized corporate change team. 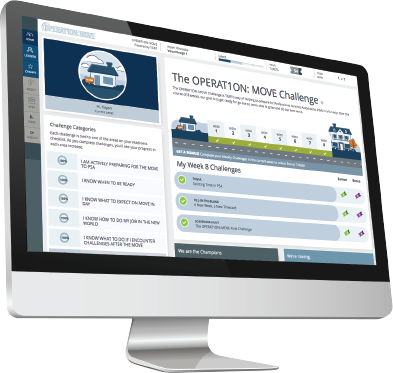 The client wound up seeing 98% completion of all tasks by go-live. With Adoptify, you gain all the elements you need to execute your change and get your team across the finish line.